A few weeks back I wrote a post which served both to introduce a book entitled Make Do and Mend and to give a general overview of the deprivations effecting the civilian population, particularly in the UK, during the Second World War. Many people took the time to add some fascinating comments regarding this subject, I was so pleased to see that my fascination with the experiences of this time is shared by other modern-day sewers. I would like to draw your attention to a particularly dedicated and knowledgeable blogger, Susannah, who has set herself an amazing challenge she has entitled ‘Fashion on the Ration’. This is her attempt to spend one year shopping and sewing within the British wartime clothing ration imposed in 1941. I, for one, am very excited about following her progress and reading her observations throughout this challenge. It was in this spirit that I decided to (literally) take a leaf out of the Make Do and Mend campaign and attempt to darn a hole that had appeared in one of my favourite pairs of socks. It really annoys me how quickly most thin mass-produced socks develop holes where the back of my ankle rubs against my shoe, and I was determined to get a bit more wear out of this particular pair. So, just like any self-respecting woman during WW2 already familiar with a needle and thread would have, I set about teaching myself to darn. I decided to use the techniques issued by the government and reproduced in the Make Do and Mend book (which can be seen above and below). In true ‘making do’ style, I (in hindsight unwisely) chose to use three strands of embroidery thread to darn with. (This is because the trip to my local haberdasher without the necessary Spanish or Catalan vocab for ‘darning wool’ left me empty handed!) Well, as you can see from the image below, things started off reasonably well, but shortly after this point they swiftly went downhill! I was really hoping to be able to illustrate this post with an image of an exquisitely executed fresh piece of darning. But alas, though the sock has received a stay of execution of perhaps one or two more wears, a lasting and ultimately successful darn did not materialise! putting something behind the hole, other than your fingers, whilst darning is essential to achieve the correct tension (my mum has something for this that looks like a wooden mushroom). decent darning wool or ‘mending’ as they have called it here apparently cannot be substituted. darning is harder than it looks! Of course, the type of wooly socks these instructions were probably designed for are very different from my thin modern kind, but I’m not convinced my socks cannot be salvaged! 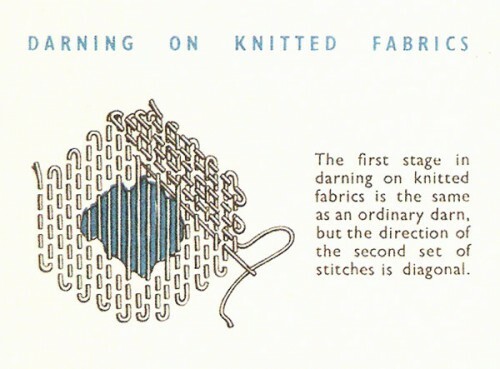 If anyone has attempted, and perhaps even mastered, the art of darning and has some advice, please let us know! Darning is one of those chores my mother always said she was glad she didn’t have to do any more, right up there with mangling the laundry. I think there’s no way around it — even with the proper tools and techniques, it’s still mind-bogglingly tedious and time-consuming. Apparently the secret is to catch thin patches before they develop into actual holes. Whoops! I have just started darning socks this past month — my 5-year old’s beloved moomin socks started developing holes. I’ve caught all the holes as they start and so far the darns are working (and hard to see!) I use embroidery thread but I pull it apart and use just one strand. And you definitely need a darning tool — I’m trying to beg one of our old darning eggs off my mom who hasn’t used them in years! An old doorknob will work though. Interestingly, my own vintage instructions have the 2nd layer going across, not at a diagonal — I wonder what the diagonal set does? I may have to try it. I agree, use the single strand of embroidery floss or try crewel yarn. the Diagonal set of the second set of stitches will help give the patch stretch. If you need to darn and can’t find a knob or a wooden darning egg you can use a light bulb. Oh my goodness, THANK YOU! I have been trying to get my mom to show me how to darn, but we don’t see each other very often and there’s always other family things that take priority. This little publication by Mrs. Sew-and-Sew is a gem! Thanks so much for sharing it. A lightbulb works as a darning egg too. Not that I actually get around to darning my socks (which are replete with holes). I’ll try with embroidery thread next time, as regular sewing thread doesn’t seem to “fill in” very well. Just had a thought that the “woolly nylon” thread people use for serging rolled hems might do the trick. Anyone tried it? You can refer to my post about darning my favorite cardigan. The video linked in the post is excellent. But most importantly, always do your darning on the wrong side of your garment, you will be pleasantly surprised when you turn it over and see the result. For my poly cardigan in the post I just used embroidery floss to fix it. I hope it helps. You probably will want to go to a yarn shop rather than a haberdashery to get the wool. I’m pretty sure that in Spain the yarn shop will operate much like your haberdasher — you’ll go up to the counter and ask for what you need. Any thin wool in the same color as your sock will work, but some companies (Regia and Lang, for example) make small bobbins of reinforcing thread for heels and such that you can buy for a a few dollars, which is generally a bit thinner than sock yarn and would work well for your socks. Also, your socks are likely superwash, so unless you want to start handwashing them, specify washable. A yarn shop will also carry darning eggs, so go ahead and buy one — they run about $10-15 and will last for a lifetime. As for what went wrong with your darning, you’re aiming to make a tight weave, so it will take a while and you may have to make several passes to get a good fabric. And you’re right, the egg is essential. A really nice tutorial can be found here: http://www.knitty.com/ISSUEsummer08/FEATsum08TT.html . It also has some good advice on how to make your heels last longer in the first place; you can do this even on the tiny gauge machine knit socks, but try to find the very thin heel reinforcing wool. If you use something rough, like regular thread or cotton embroidery thread, it could actually wear out the heel faster (according to the late, great Elizabeth Zimmerman, at least… I’ve never really reinforced my heels other than using heel stitch). Anyways, good luck! well, i was going to say most of what jessi just did! though she was way more thorough ;n) basically, use sock yarn, and make the stitches much closer together. also, i bet the reason for using diagonal stitches for the second pass on knits is that it will have more stretch this way, like fabric cut on the bias. I’m not sure how helpful it will be to darning thin modern socks.. maybe you can try a thinner material for darning them, like wool reinforcement thread sold with sock yarn for handknitters.. that could work. That’s a good idea actually, GREAT. I’m going to try that. I have always mourned the fact that, although I am an accomplished sock-darner (taught by my mother, back in the 60’s), my husband refuses to wear darned socks. It’s also becoming more and more difficult, as Diana pointed out, to darn socks because the modern product is so flimsy. Wow! Thanks everyone for your advice and links! I’m surprised there are so many people out there still with a working knowledge of darning, I am very heartened to see it! 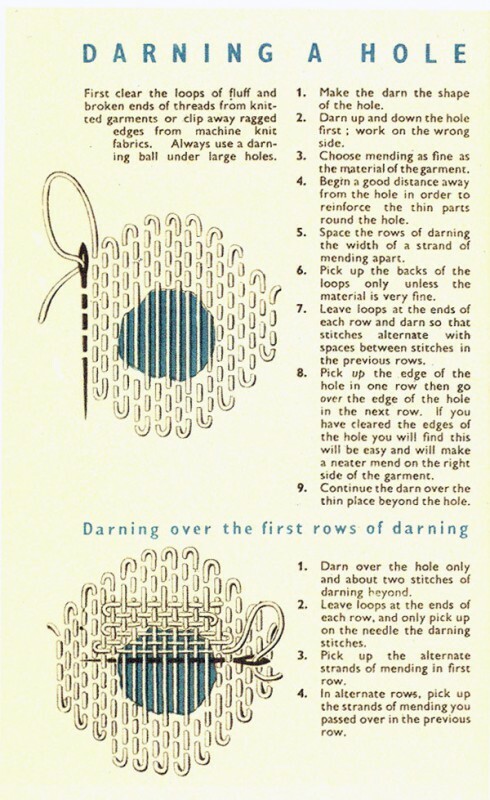 i’m really glad to read all of these darning tips. i’ve been wanting to try it because my husband and i both have sock that are wearing thin, but i had no idea how to darn. i’m going to scour the local thrift shops for a darning mushroom because they are so cute. i love this. i love mending things. and polishing my shoes! Couldn’t you use the wooden eggs from Micheal’s or Joanns? I have seen darning eggs and instead of getting a vintage one or one from your mom, why not just use a wooden craft egg? Wouldn’t it do the same thing? I have mended a special pair of socks for my son using another pair of holey socks as the patch. I placed a circular piece behind the hole and stitched it in place. It has held up fairly well. Give it a try if you have other socks to spare for patches. BTW, I forgot to add, if the socks are hand made or thicker socks, not the thin commercial ones, you can cut out a square hole, pick up the stitches at the top and knit a patch for the hole and stitch it in on the sides. Let me know if you want directions for that. I’ve done that with a whole heel and it worked GREAT!! . A lemon works well instead of a darning egg or mushroom too! And it smells good when you stick your needle in it! These are great instructions (and I love the vintage book just for aesthetic reasons). 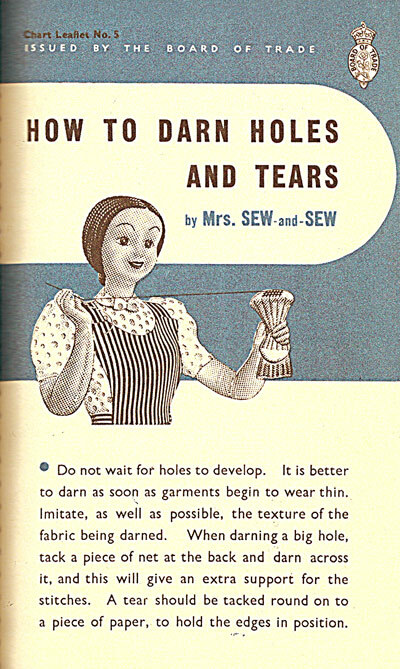 Too bad I didn’t read them before I set about darning three small and one huge hole in a favourite cashmere cardigan. However, pretty good for my first attempt at darning! So happy to make do and mend in the good ol fashioned way rather than tossing the garment. I’ll bookmark this page for future reference. Thanks! very nice design of that sheet..<3! A wood craft egg would work as a darning egg (since some vintage darning eggs don’t have handles). In true “mend and make do” fashion, you can also use an old burned out lightbulb. It also isn’t hard to find them at flea markets if you keep an eye out, my mom use to collect them. Fancy ones go for a little more, but plain or well-used ones can be had for under $5 (and often $1 or less if the seller doesn’t care about sewing tools or it is a bit shabby). As a 60 years old guy, I have my mother to thank for showing me how to darn my favorite items of clothing to a useful state again. For “Backing” use a light bulb. I keep old burned out ones and mark “for Darning Only” with a felt pen, or Plastic Easter Eggs work to keep darning needles and darning threads inside of, like a Darning Kit! Old sweaters, socks that are too damaged to repair, like the ones taken from my dog, who thought the hunting sock was a flavored chew toy, can be taken apart for darning threads. Cut the top off as evenly as possible and begin to unravel it discard the short pieces and keep the longer pieces. Wrap a little knob of the thread and then start wrapping it into a small ball. I save different colors but being a ‘guy’, I usually don’t care what color I use. Softness, size threads, and content (wool, synthetic), usually matter more. Hope this helps someone. I am attempting to darn those flimsy store bought socks with crochet thread. I am fortunate to have a darning egg. Ihave a few sweaters that need to be repaired so I just started practicing on old socks, thanks to your tutorial. (I love your site BTW!) My kids have some toy wooden maracas that I have been using and they work wonderfully! Hopefully my skill level will improve so I can make my lovely sweaters wearable again. If you frequent thrift stores or estate sales you can find darning yarns and eggs. It typically takes an older person to be reducing their stash to give up these gems. So yard sales run by younger people are not good sources. I darn everything that I can – my husband refuses to toss anything out if it can be mended, as he prefers the comfortable feel of an old piece of clothes. And often the mend is invisible, and thus a very good idea. I also hunt down “like new” clothes at thrift stores and mend them and give them to a needy thrift store for someone who can wear the items. Those items are often for sale for a dollar or less because they are damaged, but a careful mend makes them like new again for someone to enjoy. Mending is like a lost art in the US – people throw things away and buy new to replace them. I remember my mother darning socks, making all of my clothes as a child. It’s a shame that our society has become so much about everything looking perfect from food to clothes. I wish more people would say no to buying something because it has a holes and fix it instead. I had a friend in grade school whose mother would embroider flowers over holes in her Keds. She was being frugal, but I thought my friends shoes were so cute! Keep sewing on ladies! New to this blog, but love your information. I just fixed a hole the usual way, which doesn’t seem to look that sturdy. Anywhere wondered after the fact, if I could find more directions on darning on the internet. Your instructions make sense, and I plan to try them with the next hole. But I wanted to share a suggestion for the wooden egg. My wife is not the sewer in the family…but she has an old light bulb in her sewing basket. She states her Grandma would use this for darning. But my wife didn’t really know how to darn with it. Now that I have a (wooden egg) tool and your instructions we’ll have to give it a real go. Oh, this is brilliant! I have a fine-knit merino dress (not handknit) that developed a hole after only its second or third washing. Having that little diagram of how to darn knit fabric (and some proper darning wool acquired via eBay) has saved my dress! I purchase sock yarn at my local craft stores and use that for any darning, also I stitch much closer together for a finer coverage, and while I’m darning, I normally reinforce the heels and make sure to darn the other sock in the same places, this way when I wear them they feel like a pair, and not one strange sock and one normal one. I then handwash and vigorously scrub the darned spot to help the fibres mat together. Yea! It’s nice to see other darners. I darned all my cheap cotton socks that were either wearing thin or had holes in them. Sure, I can afford new socks but I darned them as a challenge to see if I could do it and still look presentable. Easy to do while watching TV! I’ve also darned sheets when they get rips from rough feet and they were still comfortable to sleep on. I’m currently teaching myself to darn with one of my husband’s holey socks. The only thing I could find to use as a darning egg that wouldn’t fit through the hole was a grapefruit! It’s a modern machine-made cotton sock. I’m using a patch cut from a random single sock, which I also unraveled a bit to get some yarn with which to darn. So far it’s going well, however tedious. I think it might be more difficult to mend one of my socks, which are a finer knit, but I rarely get holes. My son & husband have more socks with holes than without, so my son will be learning to darn as well, once I get the hang of it. A couple of suggestions on darning a sock such as your favorite striped ones. First 3 strands of embrodery floss is much too heavy for darning. The strength of the repair is in the number of small stitches you put in side by side, not in heavier thread. Second where you have highly contrasting colors like this only darn a couple of stitches beyond the hole then repeat those stitches in the second color to extend the reinforced area. Finally always use some kind of “darning egg. This can be a plastic easter egg, an incadesant light bulb, or even a piece of artificial fruit any smooth, firm, slightly rounded object will do. Not necessary to have a hard to find real darning egg, but support and shaping of your darning is essential to keep the tension even and avoid distorting the shape of the hole and your “patch”. Match the shape of the egg to the contour of the object you are darning. A hole in the turned heel of a sock would require a much more rounded “egg” than a flat patch on the bottom of the foot, etc.. I have a very old, large (English ) linen tablecloth that has 4 holes 1/2″-1″ in diameters. Most are not in conspicuous areas. I have other linen material that I could use for darning, but after reading some suggestions, I still haven’t a clue as to how to start. I really like darning my socks. I care a lot about having nice, snug socks, so when I find a bunch I like, I want them to last for a long time, but for some reason, I always seem to rip a hole in them right away. I can’t stand holes and when I tried just sewing the holes closed, it created an obnoxious bunch at the seam. 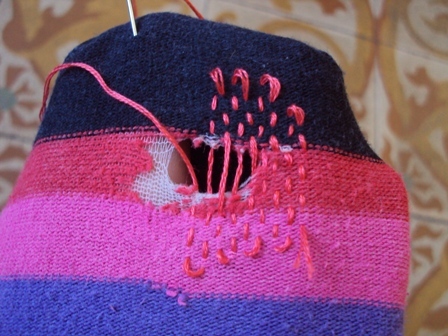 Darning fills in the hole, while keeping the surface of the sock relatively flat. My holes are always in the toes or on the sole. Since the darning will be covered up by my shoes, I don’t bother to match the darning yarn to the sock color and actually I find that using a contrasting color makes the darning easier. The suggestion of using a light bulb as a darning egg is interesting, but I’d be scared I’d somehow break the bulb and my sock would be filled with glass shards. I just stick a water bottle in my socks as the form. Really, any hard sphere or cylinder will work.